A practical and beautiful solid timber vanity that brings a touch of luxury to your bathroom. 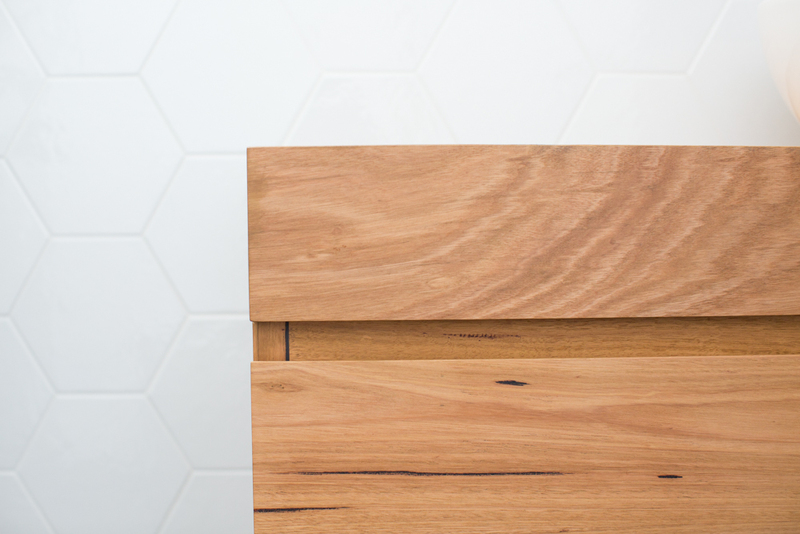 The shadow line finger pull drawers creates clean lines that ensures that the beautiful timber is the star of the piece. This vanity is created from solid Australian Chestnut timber ensuring the piece will be beautiful and structurally sound for many years to come. The neural light brown toned hardwood timber has a low character level leaving the vanity with a clean finish that fits perfectly in a variety of design styles. Each vanity is designed and made made to order to ensure the piece is the perfect fit for your space, plumbing and basin. The design is customizable to suit your functional requirements such as adding an additional layer of drawers or cupboards. The internal structures of the vanity can be created from solid timber, birch ply or melamine depending on budget and preference. To find our what makes our vanities so special, click on the link! finish natural oil and wax. More info here. Custom recycled timber furniture servicing Geelong, Melbourne, Sydney, Brisbane and Adelaide, Shipping available Australia Wide.